Spider-Man vs. Doctor Doom. It sounds like a joke. It should be a joke. 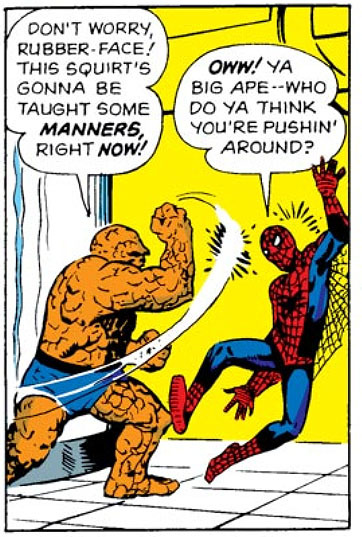 I mean, the strength of Spider-Man lies in his "everyman" appeal, and his villains often reflected that, usually being simple thieves like the Vulture or the Sandman, rather than cosmic menaces or maniacal dictators. 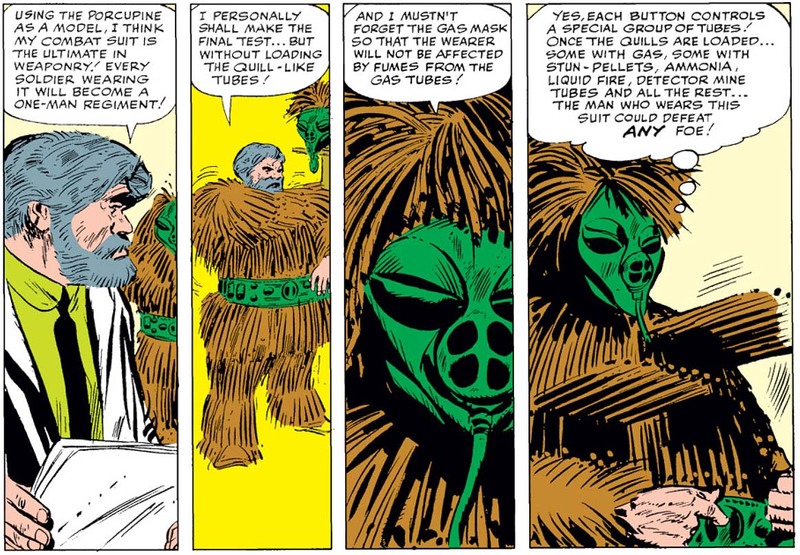 (And it's worth noting that the one appearance of alien invaders in these early issues would later be retconned to a hoax.) 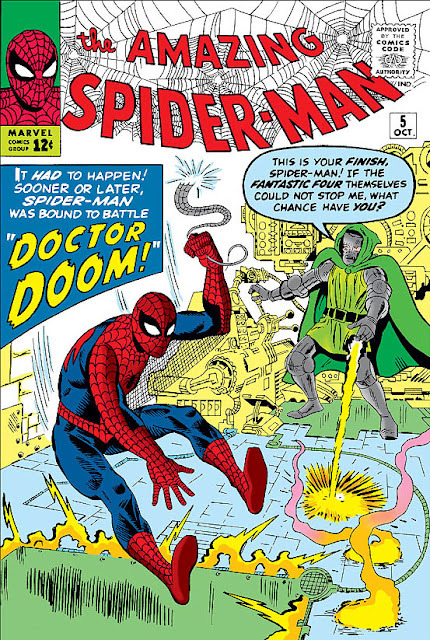 But having Spider-Man fight Doctor Doom isn't all that different from (say) pitting Ant-Man against Galactus, or Thor against Egghead; such pairings might prove briefly interesting to highlight the different worlds these characters come from, but it becomes quickly apparent that they just don't belong in the same story. And I'd argue that this is backed up by the fact that the fight scene between the two of them takes up almost the entirety of the second half of the comic - almost as if Lee & Ditko realized, once they were committed to the story, that there wasn't much unique or noteworthy to be gleaned from the mash-up, and so just filled out the pages with the standard superhero fare of trading attacks. Not one of Doom's most dignified moments. Still, you can appreciate the impulse behind such a move. Over the last year, Stan Lee had been tentatively drawing the connections between all these new superhero creations, and selling the fiction that they all lived in the same world. 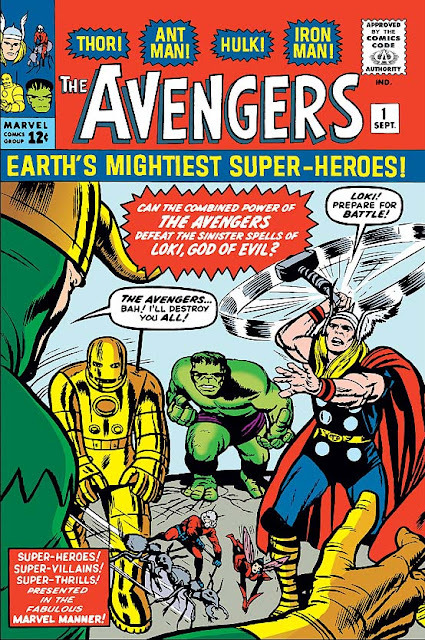 The first step in that direction had occurred when the Hulk appeared in the pages of the Fantastic Four not just in passing but as the issue's monster menace du jour, and culminating this same month in the superteam-of-disparate-parts known as the Avengers. 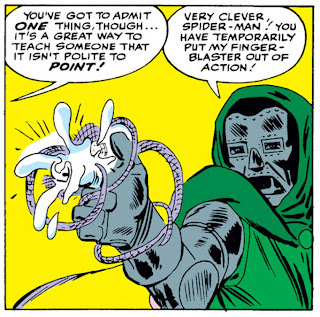 So even if Victor Von Doom weren't the most natural of enemies to face off against a high-school kid, you can understand the intention towards a tighter continuity that Stan Lee was going for. In fact, this is most visible when Doom recounts how he last escaped the Fantastic Four; there may not be a footnote directing the reader to FF #17 (as would quickly become the norm), but any readers who were on board for that adventure as well would recognize its ending instantly. My favorite part is the mid-air judo kick at the end. Is he trying to give gravity a beatdown? Some might say there's a lesson to be learned here. Sadly, Flash Thompson is not one of them. Finally, with this issue we've got another milestone worth marking - as the comic graduates to monthly! All of Marvel's new titles have begun as bimonthly publications, coming out every month, from The Fantastic Four to The Hulk, and even up to such new additions as The Avengers and The X-Men. The FF made the jump to monthly with issue #7, almost a whole year after their first issue had debuted. Their second all-new title, The Hulk, didn't make it past issue six. So it's something of a vote of confidence - or else evidence of pretty spectacular sales - to see that after only four bimonthly issues, The Amazing Spider-Man jumps to monthly status with issue #5. Marvel's star certainly seems to be on the rise! Special guest-stars, comedy at Flash's expense, and the first real flirting from Betty. In all ways, a fitting denouement! Only the third issue, and already their reputation precedes them. 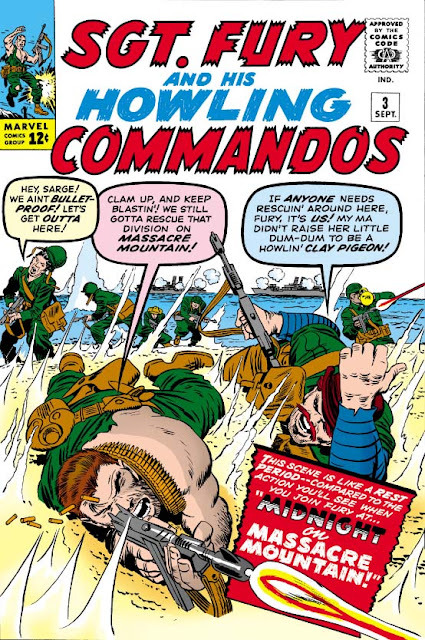 But then, the way that the Howlers are perceived in this war is something of a minor theme this issue. When Dino Manelli is sent ahead to scout out a ruined town, an old Italian gentlemen recognizes him as an American and asks, "You have come to rescue us, si??" Moments later, Dino is surprised by three other men, who turn out to be U.S. correspondents covering the war. In the midst of the Commandos' mission, the lead journalist keeps pestering Fury as to his heroic plans, which annoys Nick to no end - but the question of the media's role in wartime, and how the embedded journalists sometimes risk as much as the fighting men, has nevertheless been raised. Not bad for a kids' comic magazine! 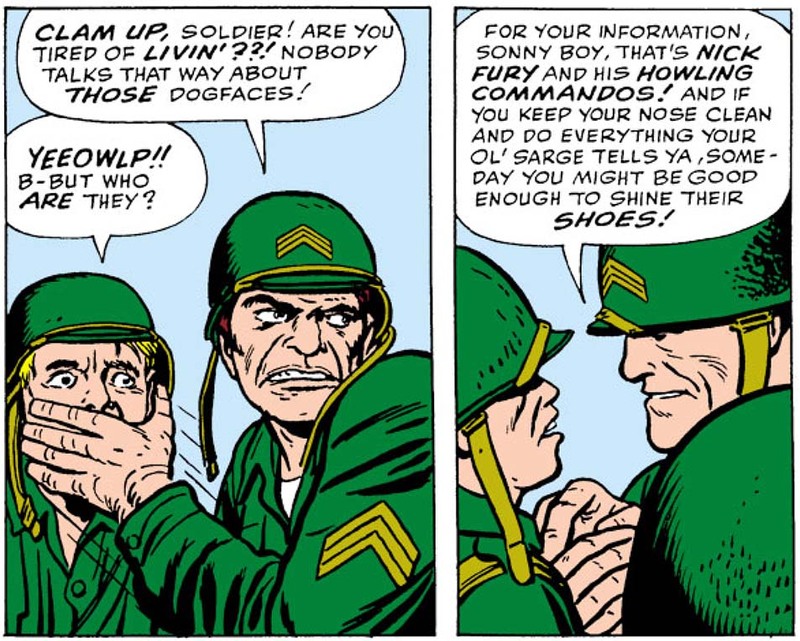 Stop wastin' the sergeant's time, mister - or you'll run outta time to waste! Sgt. Fury meets a certain someone for the very first time ... and it certainly won't be the last. In this issue - the birth of The Porcupine! Yes, that's right: The Porcupine. 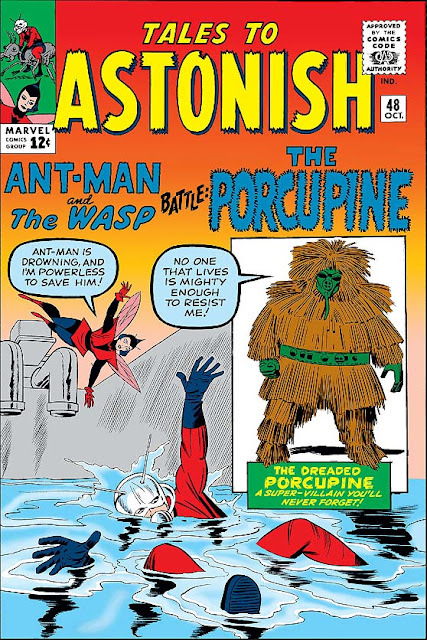 I'd be tempted to wonder if this newest creation is the weirdest or most laughable terror that's featured in the pages of Tales to Astonish, but let's remember - this is Ant-Man we're talking about. On the subject of lame baddies, this guy fits right in! Although, honestly, it is a bit surprising to realize that Porky is in fact only the fourth character Ant-Man has gone up against who could rightly be called a super-villain, given how many times Pym has gone up against spies, aliens, and mutated beetles. 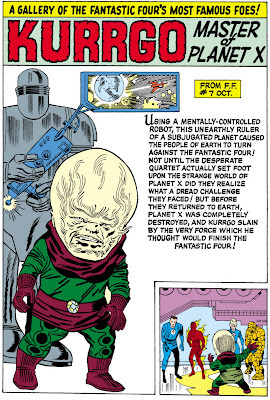 And the previous three super-villains were Egghead, the Protector and the Hijacker! Like I said: Fits right in. As to the Porcupine himself? Alex Gentry, an army scientist designing a combat suit for American troops, hits upon an unusual bit of inspiration while alone in the lab. "Yes, the porcupine is nature's perfect fighting machine for attack or defense," he ponders, "a creature that wears its weapons, and then shoots them at his enemy! So simple, so direct ... so foolproof!" Er. Except for the fact that they don't. At all. Ever. But hey, you wouldn't expect an army scientist to do his own research, would you? It's not like he had Snopes back then. In any case, apart from the name, design and inspiration, the idea itself isn't too wonky, as his suit doesn't just fire sharpened quills, but rather a varied assortment of weapons and aids: stun pellets, liquid fire, sleeping gas, fog pellets, liquid cement and more. It's such a multi-use approach that you can't help but wonder if the character could have become something more ... if he'd just been named something other than The Porcupine. Still, they're careful to have the villain make his escape at the tale's end, and it's far from the last time we would see this character. As perplexing as that thought might be. What we do see the end of, however, is Ernie Hart's run as scripter, having done a decent job on these past five issues. As with fellow scripter Robert Bernstein, he was good enough for what was needed; Hart's later issues may not have impressed as much as his first, featuring the introduction of the Wasp - but he also never came up with the kind of howlers that would crop up in many a Larry Lieber script. Note, however, that Hart's last script for Ant-Man comes at the same time as Bernstein's last script for Thor, and replacement scripters aren't forthcoming for either one. Instead, beginning with the next issue of each series, Stan Lee will take over the full writing duties on each, providing both story and script, rather than just the plot. There's been talk in the comments as to how the summer of '63 really seemed to be the time when Marvel started firing on all cylinders, and this may very well be a large reason why: Faced with Marvel's growing success, Stan finally began to pay more attention to the lower-tier characters he had previously somewhat neglected. It may not have worked in every case - Pym would never quite be a sales giant, for instance, and would eventually be nudged out of the title entirely - but the fact that this is when all the stories began to be written by Stan (as opposed to story-by-Stan, words-by-Other) should not be overlooked. In what seems a culmination of the last two years of storytelling, the Avengers are born! And the comic itself proclaims: "The first of a star-studded series of book-length super-epics featuring some of Earth's greatest super-heroes!" The wording there ("book-length") is notable; Thor, Iron Man, and the team of Ant-Man & the Wasp all have half-length strips, while the Hulk had his book cancelled last year - so none of these characters currently had full stories of their own. And since Stan had noticed the enthusiastic reader response any time one character guest-starred in the comic of another, putting several of Marvel's new creations together in one mag was a no-brainer! On to the story! The trickster god Loki, out for revenge against Thor as usual, hits upon a cunning scheme: By making the Hulk look as if he tried to destroy a passing train, Loki hopes to lure Thor into battle with the monster. And sure enough, when this near-disaster makes the paper, Rick Jones and his Teen Brigade send out a cry for help to the Fantastic Four via ham radio. The FF miss the call, but it's soon picked up by Thor's human guise of Don Blake, as well as Hank Pym, Janet Van Dyne, and Tony Stark. And the chase is on! When the Hulk stomps around half-naked, his book gets cancelled. When he dresses like a clown, they give him a team. Go figure! The Hulk quickly hides out from the heroes by posing as a robotic "strong man" in a circus, though you'd think he might not trust such a place, given his previous encounter with one. 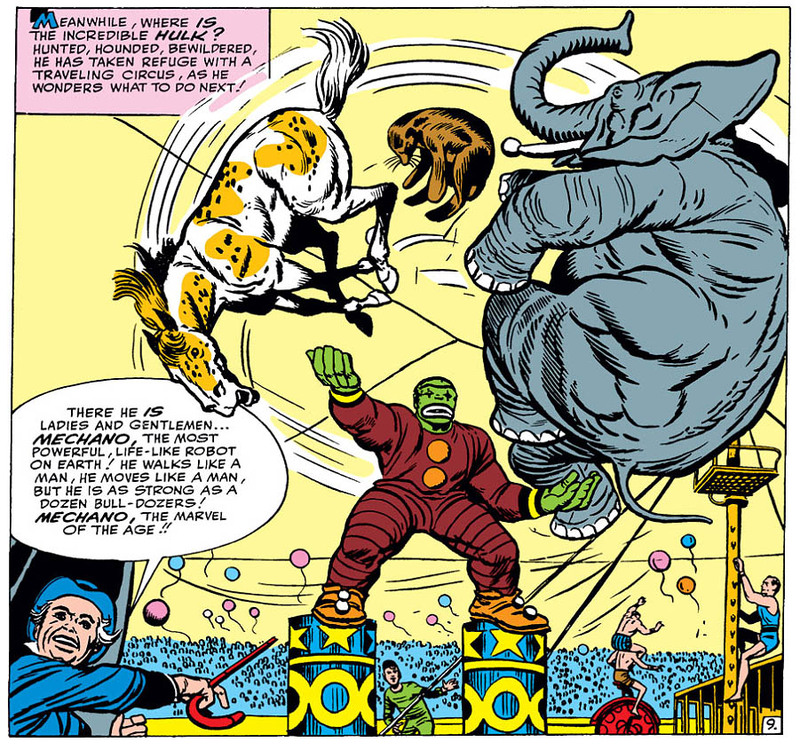 It also might seem unusual to the modern reader to see the Hulk engaging in such subterfuge at all, rather than simply running or fighting. However, after all the rapid changes to his character in the six issues of his series, he seems to have settled into the antisocial but still intelligent persona he started out with; "dumb Hulk" won't be the character's norm for a while yet. 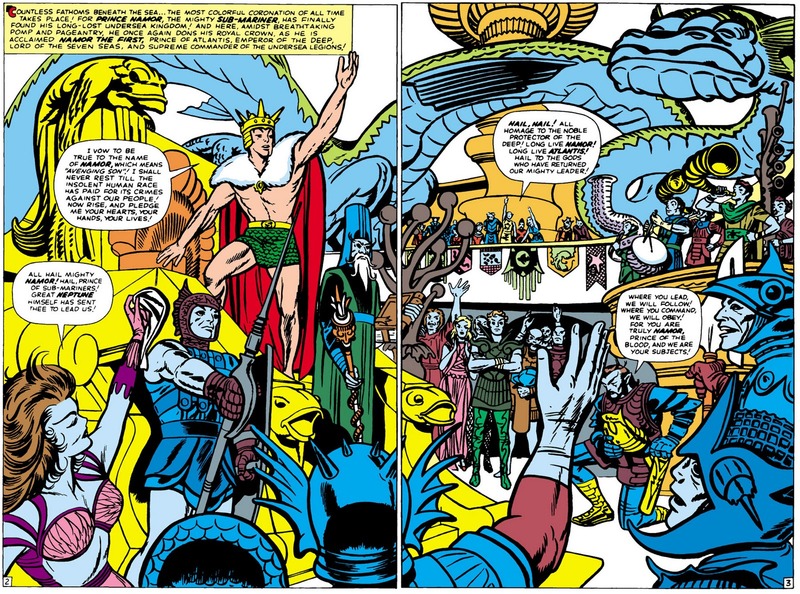 Meanwhile, when Thor heads off to Asgard to track Loki down, we're treated with a significantly deeper look at the heavenly home of the gods than anything we've seen in Journey into Mystery so far, including our first glimpse of Asgardian trolls. Fortunately, these are things Stan & Jack would start to delve into much, much more - starting, in fact, with JIM's very next issue. such radically different atmospheres as the gloom of an Asgardian swamp. The team is formed! And it's such a fantastic lineup, I'll bet the rosterstays exactly like this for a bajillion years. Or - maybe not...? But as to the villain of the piece? Not nearly as much originality. The New York Museum has come into possession of a sarcophagus said to contain the body of Merlin - but sure enough, when it's opened and left on its own, he leaps to his feet! (Turns out he was just sleeping.) If this plot sounds familiar to you ... that's because we just saw it two months ago! I mean, come on - they even have the gall to once again call him "The Mad"! Look, I can understand the recycling of plots in the Golden and Silver Age; after all, the common wisdom of the time was that the readership turned over every few years, as kids became teenagers and discovered other concerns, while other kids started reading. So it's fine if you recycle your plots every few years. Two months later? Not so much. That said: Merlin is, honestly, hilarious. He first appears at the police station, but they just laugh him off. So he then goes to the White House to talk to JFK, but decides no one who looks that young could be a nation's leader, and leaves. 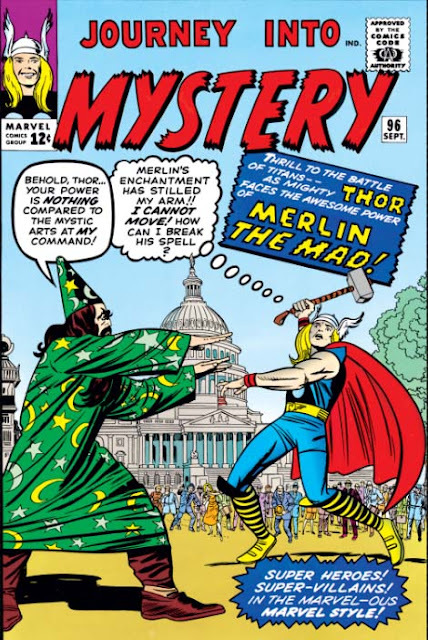 Next, he throws the Washington Monument at Thor, attempts to trap him under the Pentagon, and finally animates the statue at the Lincoln Memorial to attack the thunder god. In the end, Thor wins by bluffing that he has more powers than he actually does, which frightens the villain so much that he agrees to flee at once - the exact same gambit we first saw Reed pull on the Skrulls in Fantastic Four #2. Side note: Merlin tells us that "Nobody in medieval times suspected I was one of the mutants on Earth ... deriving my powers not from any occult magic ... but from within my own body!" After being told by his publisher that no one knew what a "mutant" was, Stan appears to have taken it as his mission to educate his readership ... in every single comic! This is the greatest reception to a power-mad fiend I think I could ever see. Now this? This is one HECK of a package! The Strange Tales Annual came out just a few weeks ago and, like this comic, it too boasted a ridiculous 72 pages. The difference? The Spider-Man / Human Torch story which was the lead there was 18 pages long - still an upgrade from the standard 13-or-so that the Torch feature usually got - followed by ten short backup tales. In other words, what you'd expect an annual for Strange Tales to look like; its regular format, but more so. But here? The 72 pages is almost entirely new material - the only reprint being the Fantastic Four's origin from FF #1 - and kicks things off with a 37-page adventure! (In fact, a blurb on the front page proclaims it as "the longest uninterrupted super-epic of its kind ever published!!" Anyone know if that was true?) So don't be surprised if this post is similarly gigantic...! 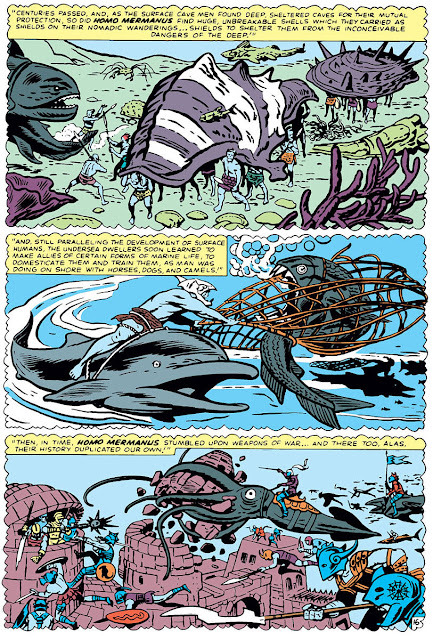 The amount of information given in just two comic book pages is kind of stunning. Stan always said they read every letter and listened to the readers - and here's the proof! So if the main story is 37 pages, and there's a 15-page reprint ... what else is left? Quite a bit, as it turns out! 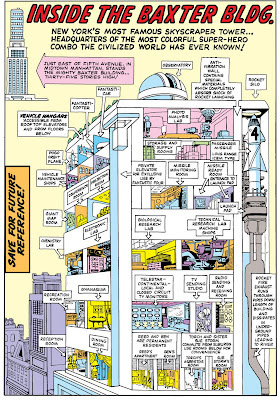 For instance, there's a two-page "Questions and Answers about the Fantastic Four", as well as a full-page cutaway diagram of the Baxter Building. 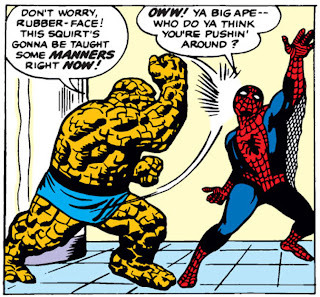 And we also revisit the first meeting between the FF & Spider-Man, from Amazing Spider-Man #1 ... but rather than being just a reprint, the two-page sequence from the comic is actually retold and expanded into a six-page tale! 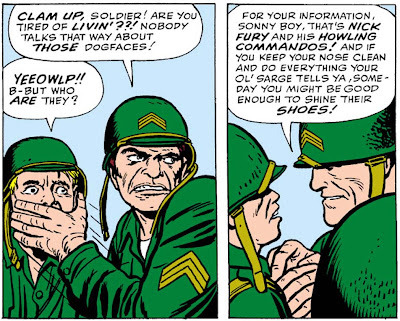 (This isn't entirely without precedent; for instance, in Rawhide Kid #17, Jack Kirby illustrated the Kid's origin ... and one year later, in #23, he re-interpreted the exact same story, word for word! Here, you at least get to see the differences in how two greats - Kirby and Ditko - illustrate essentially the same scene.) And between all of these is the running feature "A Gallery of the Fantastic Four's Most Famous Foes! ", in which every single threat the FF has faced thus far rates an entire full-page splash each, with accompanying text - the Mole Man, the Skrulls, the Miracle Man, the Sub-Mariner, Doctor Doom, Kurrgo, the Puppet Master, the Impossible Man, the Hulk, the Red Ghost and his Super Apes, the Mad Thinker and his Awesome Android - for an additional eleven pages. Remember, now, that a normal comic at the time cost only twelve cents. This annual was twice that - but you can't say the readers didn't get far, FAR more than their money's worth! This is how the story kicks off. That's a lot of grandeur ... but deservedly so! 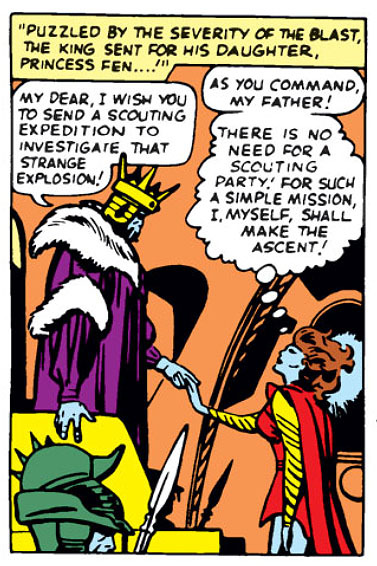 So, yes, starting things off with a bang: Namor has found Atlantis! And that's a major development in the evolution of this anti-hero, as for the first time since his return he once again has a people to lead, and responsibilities to consider. Don't go thinking he mellows out, however, as it doesn't stop his desire for revenge - though it perhaps tempers his recklessness somewhat. Even better, for the first time Namor starts to get a supporting cast around him in the persons of Lady Dorma, infatuated with Namor, and Warlord Krang, who is devoted to Dorma. (And note how this love triangle parallels and contrasts with the one involving Namor, Sue and Reed.) 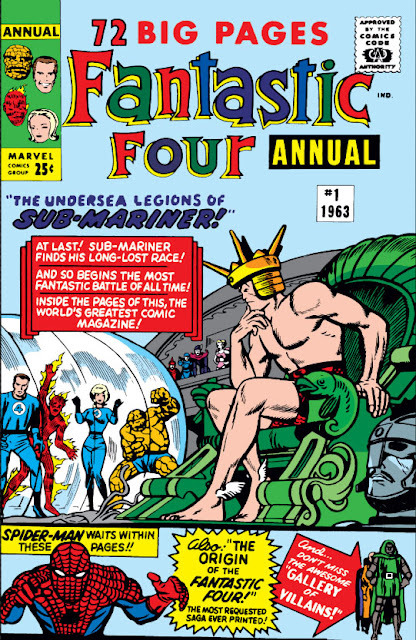 By setting this up, Stan Lee has instantly planted lots of story seeds for future Namor tales; was he already thinking of how soon he could launch the Sub-Mariner in his own mag? a huge amount of background - and we don't mind! 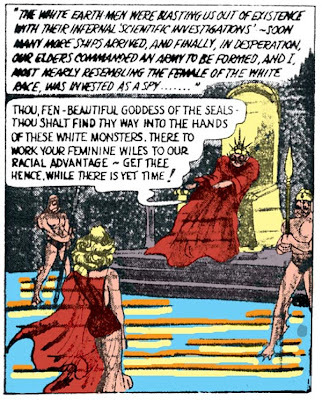 We also, astonishingly, get an abbreviated yet broad anthropological history of the Atlantean race, stretching from antiquity up to the present day. For the first time, Stan & Jack are truly expanding the scope of their stories, and you get the sense that they're doing some real world-building as they lay in the foundations of Marvel's ancient past. And they don't just limit this to the beginnings of Atlantis itself, as we also get a full origin of Namor - for the first time since the Golden Age! When the Sub-Mariner was brought back in Fantastic Four #4, he was just given the most basic of introductions: Here's this character, used to be famous, been away for a while, and now he's back. At this point, however, we actually get to see the way his parents met: his father a human sea captain, his mother an Atlantean princess, and a star-crossed love that ends in tragedy! On the left, 1939's Marvel Comics #1. On the right, the same scene in FF Annual #1. Note how much Stan & Jack have toned it down from the original! Stan Lee tells the story of how he first planned on calling the X-Men "The Mutants", but was prevented by publisher Martin Goodman, who claimed that no one knew what a mutant was. Ever since the X-Men's meteoric rise in the 1980s, however, mutants have been a well-known and commercial concept at Marvel - so much, in fact, that when Namor received a new comic book in 1990, it quickly earned the tagline "Marvel's first and mightiest mutant"! This wasn't restricted to Namor, by the way; teenage runaways Cloak and Dagger, who had previously been determined to not be mutants, were rechristened as such with their 1988 series. Everyone wanted to jump on the mutant bandwagon, it seemed - and with the X-Men's sales, why not? And we see that even today, where Namor has just had a new series launch - Namor: The First Mutant - as, ostensibly, part of the X-Men line. I'll admit, all of this retroactive mutancy has always seemed a bit gimmicky to me, and to many others. But in reading this issue, I had a bit of a shock to find that he was referred to as a mutant as early as 1963! 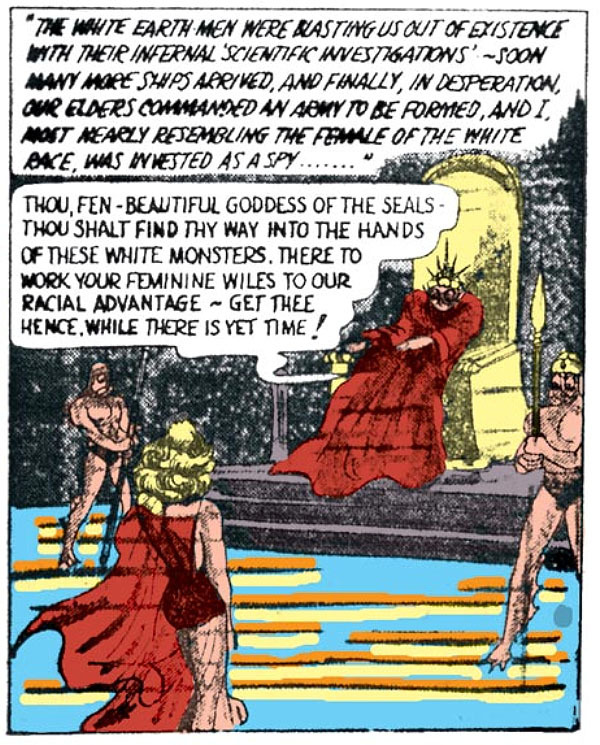 For the very first time, the kids in 1963 really knew where Namor had come from. Sadly, not everyone gets the same much-needed developments to their character that Namor does. Case in point: Sue Storm. When we first open on the FF, Ben Grimm is dealing with the Yancy Street Gang while Johnny plays a prank on him. And what is Sue doing in her free time? Lounging about, reading a fashion magazine. Because, y'know ... that's all women do, right? Then, when her closetful of fancy dresses gets destroyed during yet another Thing-Torch brawl that's gotten out of hand, she breaks down in tears and rants about the beastly nature of "Men!" Although later on she displays empathy & understanding about Namor's motives, and tries to stop the fighting rather than continue the conflict, with traits such as these first on display it's not hard to see why a sizable percentage of the FF's readership were utterly bored by her. 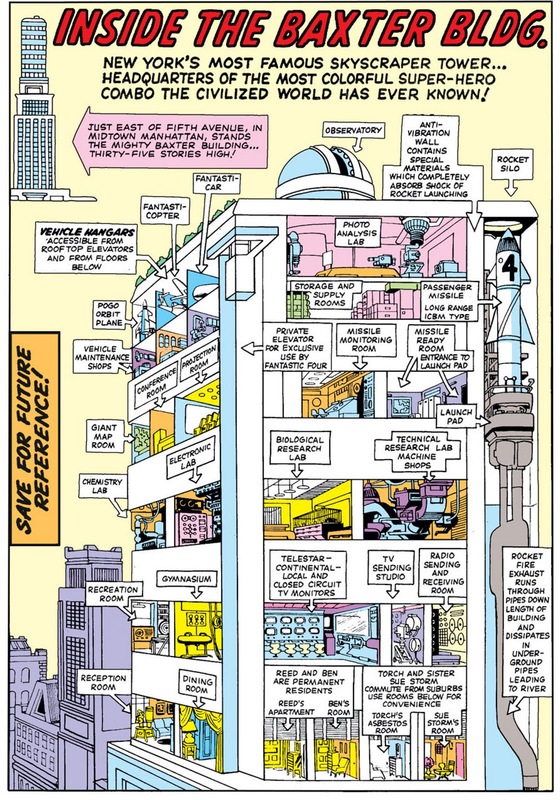 The first time we saw this cutaway, it was a couple of floors in one panel. This time, it takes up an entire page! A defining characteristic of the FF that's often overlooked is their role as explorers, forever challenging the unknown (so to speak). Here, we're reminded of that in the wake of the Torch-Thing brawl, when Reed points out that they're all stressed - so why not take a vacation? Though he quickly follows this up by pointing out that there have been several sightings of sea monsters in the Atlantic Ocean, which could bear some investigating - so, okay, a working vacation then. The four promptly book a cruise on a luxury liner, and Ben's girlfriend Alicia comes along ... well, just because. As teenage Johnny bemoans the couplehood of both Sue & Reed and Ben & Alicia, we find we can easily dismiss any lingering doubts that the blind sculptress has been fully accepted into this unusual, created family. All the villains showcased in this gallery, and I choose Kurrgo??? Well, what can I say - I've a soft spot for the fuzzy little freak. On the left, Ditko's original scene from ASM #1. On the right, the retelling by Kirby. Note how in the Ditko version, the Thing is still in his "lumpy oatmeal" form.